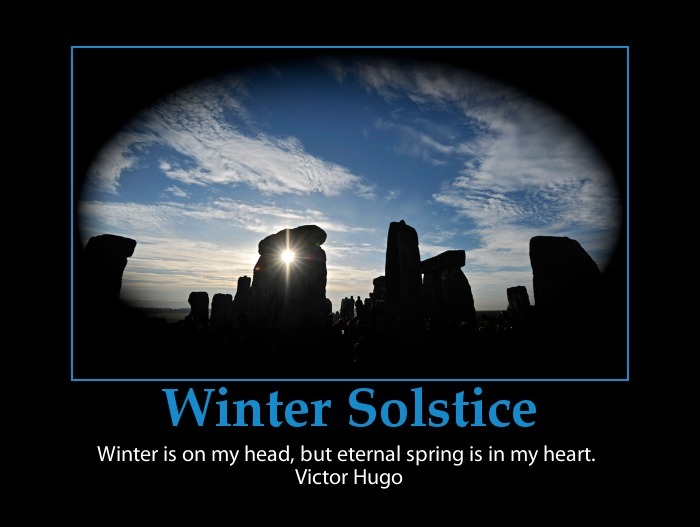 Fav Quote Friday | Body & Spirit: Celebrating The Winter Solstice! but eternal Spring is in my heart." Wow, I am so wrapped up in helping my elderly uncle over his recent car accident (I did a lot more work on it today), that I forgot it is the beginning of Winter. Thanks for the reminder! You're welcome, MikeB! I hope you took at least a moment to reflect on this special change of season day! I did not take a moment. Too wrapped up. Then my aunt was taken to the ER on Jan. 4 and I was on a plane to Florida the same day and got there early morning of Jan. 5. She died Jan. 15 and was buried Jan. 16. I'm glad I had time with her (even though she probably did not know I was there), and that I was able to help her elderly husband. Got home midnight Sunday. oh MikeB, I am so very sorry to hear that news! My deep condolences on the loss of your aunt. Good to know you had that time with her. Sending you and your family my sympathy, and also strength during this difficult time. Thanks, Stephanie. I got home on Jan. 20 from the trip during which my aunt died. Then, I left home on Jan. 23 for the other end of the spectrum: life; went for the christening of a 5-month old baby (my grand nephew). Stayed two weeks (in New Jersey) to visit my wife's family. Back home now, catching up on things (home repairs, mail, etc.). Sorry about your aunt, but I'm very happy to congratulate you on your grand-nephew's christening. Hoping that this last trip was a good counterpoint to the previous. Wishing you many more blessings in your life! Yes, it was a good counterpoint, Stephanie. And thank you for being one of the blessings in my life: your sweet and thoughtful messages mean a lot to me. I am happy to know that- you are most welcome, MikeB.